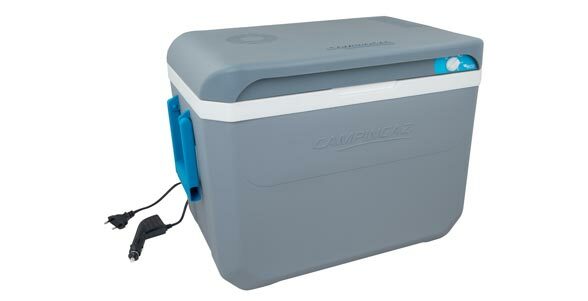 The Powerbox® Plus 36L 12/230V active cooler operates off a 12V car plug-in or a 230V electrical outlet (both cables included), combined with the highperformance injected PU foam, the cooler will keep contents at 169˚C below the ambient temperature. It features a control dial with 4 modes, allowing you to choose the performance and efficiency level. The cooler can be turned off by putting the dial on “OFF” mode without the need to unplug the cord. To reduce the noise level of the fan switch to “NIGHT” mode, and for an efficient, yet environmental friendly operation, the “ECO” mode can be used, giving an A++ energy rating. “MAX” mode is available for the ultimate cooling performance. Assembled in Italy. Inhibiting the ability of microorganisms to grow, cooler features an Antimicrobial Liner, a powerful protection ensuring resistance to mould and mildew growth inside the coolers and it also blocks unpleasant odours from developing.